Hallux Rigidus / Limitus | Marathon Orthotics, Inc. Treat the pain of Hallux Rigidus with a Rigid Morton’s Extension. The Hallux Rigidus pathology can be treated by adding a Rigid Morton’s Extension to any functional device (excluding Carbon Fiber) to reduce the pain associated with dorsiflexion of the hallux. What is a Rigid Morton’s Extension? 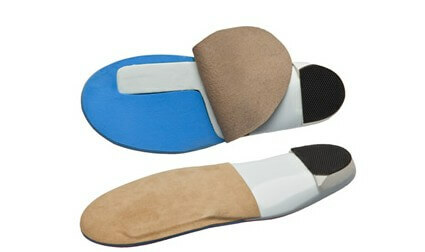 It is a full length continuation of the plastic shell material distally under the 1st met head and the hallux. The Rigid Morton’s Extension portion of the plastic under the hallux may help to reduce painful motion of the hallux. The distal portion of the rest of the shell is cut normally, proximal to met heads 2-5. Please check Rigid Morton’s Extension in the Accommodations section of the prescription order form.